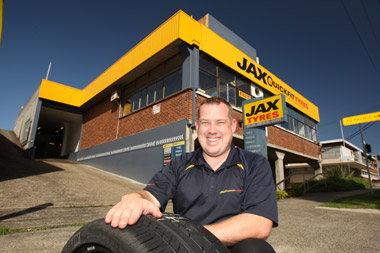 Scott Downey is the owner of JAX Tyres Artarmon, on Sydney's Lower North Shore but his background as a mechanic includes years of experience in the service arena for some of Australia's leading car dealerships and companies, including Porsche Sydney. "Porsche is a phenomenal product and I really wouldn't want to work for another car company after three very happy years with them" Scott says. "But I did want the challenge of running my own show and when this opportunity came up with JAX Tyres, it was just too good to ignore." The store on Reserve Road provides the right tyres for your vehicle and services those living close to Castle Cove, Middle Cove, Roseville Chase, East Lindfield, East Killara, Killara, Gordon, Roseville, Lindfield, West Killara, West Lindfield, Chatswood, Willoughby East, Willoughby, Chatswood West, Lane Cove North, Lane Cove West, Lane Cove, Riverview, Longueville, Artarmon, Osbourne Park, Greenwich, Crows Nest, Wollstonecraft, Naremburn, North Sydney, Lavender Bay, Linley Point, Middle Harbour, Northbridge, Castlecrag, Mosman, Neutral Bay, Cremmorne, Cammeray and surrounding areas on the Lower North Shore.